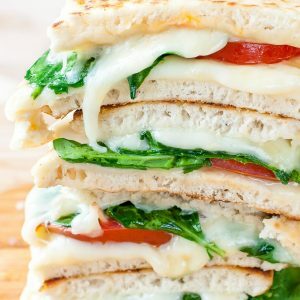 Spinach and Tomato Grilled Cheese Pitas: dunk them in your favorite soup or face-plant into them all on their own for a quick and easy lunch that's always a hit! Prep your veggies + cheese so they're ready to go. Heat a pan or skillet to medium-high heat and add 1 tsp butter. Once butter begins to bubble, add a pita to the pan. Top with cheese, spinach, tomato, and a little extra cheese on top. Top with remaining pita round and grill. For an extra hot and melty center, pop a clear pot lid on top. Before flipping, add another tsp of butter to the pan, or feel free to spread it on top of the dry side of the pita - both techniques work! Pop your lid back on if you’re using one and grill each side until golden brown with a melty center. Cut into 4 wedges and dive in! You can use pre-sliced or freshly grated cheese for these grilled cheese pitas. Feel free to add any of your favorite grilled cheese extras! I'm super partial to adding a dash or two of hot sauce or fresh + flavorful pesto. You can even add extra veggies - go for it!